Mozzarella cheese. I'm pleased with my first attempt. It didn't go exactly like the instructions said but turned out alright in the end. Oh, and I must get me some rubber gloves - ooh, matron. The kneading, stretching phase only works when it's hot. The instructions said I'd need the rubber gloves but I didn't have any. 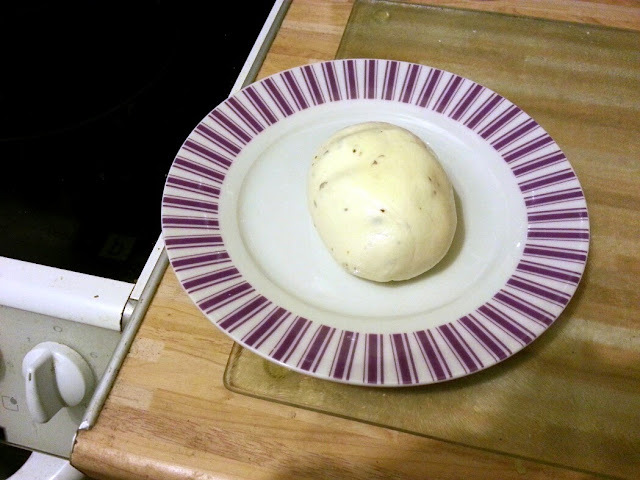 Anyway, after a few short zaps in the microwave, some stretching as best I could manage without burning myself and a sprinkle of mixed herbs, it went from lumpy yuck to smooth herby mozzarella. It maybe ended up going a little stiff - ssh, stop it - but now I know how the process works hopefully I can completely nail it next time. Oh, and it tasted alright too, topping off my sourdough base pizza. But a good run anyway. Martin and I picked up a stray for our lunch run up over Dundry today. It's been a very long time since there's been three of us out there. As to the run, we weren't any quicker than last time but it felt better. I felt I ran with a little bit more form. Despite not being quick I reckon we at least looked like proper runners today - although, perhaps, proper runners might have begged to differ. CR On The Central Path, Hope Wood.. The Ol' Forestry Have Really Done A Number On The Trellech Map.. I was back over to Trellech for another look at the area. I parked up south of the area and ran in. Thinking I could use the area around Beacon Hill and a bit of the area north, across the road. Even the Beacon Hill area has sustained some significant damage from the commission. I guess it is their - or should I say 'our' - forest after all but I'm worried I'm going to be able to plan a course at Trellech at all considering the state of things. This is going to be the first time I've planned and it would be nice to use a map that wasn't so trashed. On the upside, I did manage to find a few good controls in areas that haven't been wrecked but I'm just not sure I'm going to be able to join up the dots and avoid all the kack. Still, it was a good day out, if a little chilly, at least the sun shone. Hell I am knakered after that infernal brown course. I covered just over 11km with 1500ft of ascent, made a few mistakes - including a five minute clueless moment - but overall I navigated alright. After everyone was back in I headed back out to collect nine of the controls, covering a further 3km. Fact:- carrying nine control thingies - I think that's the official orienteering term - is a) quite a handful and b) quite arm ache inducing. That done, thoughts are turning to a weekend away. I am thinking classic Snowdonia. A three day special taking in the Carneddau, the Glyders and maybe that big one with the cafe at the top.... tell me again, why did they build a cafe at the top of such a scenic beauty? Cross? I was livid! - I wasn't really although I could've done with little less mud. It wasn't a bad course as cross country goes but by the fourth lap I was wishing for the finish. I took it steady and gained places all the way. That definitely helped keep me going. I am extremely glad I decided to see sense and not go to TyF yesterday because my legs are aching after just today's race. Not sure I'd have made it round if I'd raced yesterday too. Third run in four days! No, can't feel any bumps on the head. I ran the reverse Velthouse Lane loop tonight. Not sure which is better, a step hill at the start or a more grinding, steady one at the end. Still I was a minute quicker and have my marker down for the reverse - not to mention the Strava climb target registered. Only a bike session tonight in front of the telly. My quads are still sore from my initial bid for fitness. The plan is another run tomorrow, a rest day Friday and then Tor y Foel fell race Saturday followed by the silly notion of the Pontllanfraith LCL cross country on Sunday - no, I cant believe I'm entertaining the idea either - but I am! The health kick continues - and no, it wasn't horrible. It was actually pretty tasty. Topped with a little parmesan and black pepper. I also managed another run, the Dundry loop, at lunch time with Martin. The climb seemed somehow steeper and longer than I remember... but then maybe that's because I was slower and it took longer. Still, on the upside, it's another run done and at pretty much the same pace as yesterday's effort. Which is an improvement as the main Dundry climb is twice that of Longhope hill. Mind you, my legs are sore as heck now. The first road session of the year. I say session, it was more of stroll really. Still, I have a marker down. I ran the famous Velthouse Lane loop. Okay, it's not very famous outside of those few inhabitants of Velthouse Lane - and even then it plays second fiddle to its more famous cousin Mill Lane. The loop was just over five miles and I can't bring myself to say the time. Quick it was not. To those on Strava who might see it. May I ask you not to laugh too loudly - and take into consideration the quite big hill at the start.